Cost-share funds are available from Allamakee County Environmental Health on a first come-first serve basis for Multiflora Rose eradication. The county has budgeted $2,500 for fiscal year 2013 (July 2012 – June 2013) to provide 25% cost-share for the chemical only, not labor, used to spray Multiflora Rose. The chemical is only supposed to be used on Multiflora Rose and not on any other weed. If the county finds out that the chemical is being used to treat other weeds, they may cancel the cost-share program entirely. Please spray the Multiflora Rose and then bring a bill for the chemical to the Waukon NRCS Office at 635 9th St NW between the hours of 7:30 a.m. and 4:30 p.m.
1. 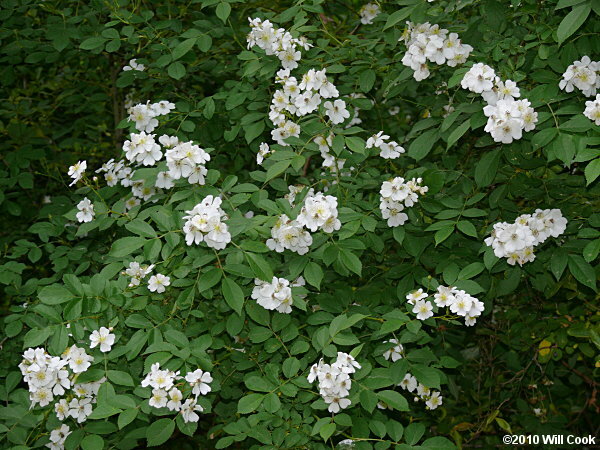 Purchase a chemical recommended for use on Multiflora Rose (examples are Crossbow, Grazon, and Forefront). 2. Spray the Multiflora Rose. 3. Bring a bill for the chemical to the Waukon NRCS office at 635 9th St NW in Waukon. Name of the chemical purchased. We will then send a copy of the bill and the labeled map to Allamakee County Environmental Health Sanitarian at the Allamakee County courthouse. She will process the bills and, assuming funds are still available, will send the cost-share funds to the person specified on the bill. If you have any questions, you can contact us at 563-568-2246 ext. 3 or call Laurie Moody, the County Environmental Health Sanitarian, at 563-568-4104.